Producer's Edge Digital Edition Subscriptions page. Congratulations! And thank you for digging in to the Creative Journal of Hip Hop, R&B and Rap Music Production. With your subscription you are embarking on a rewarding journey of musical discovery and personal accomplishment. We hope Producer’s Edge can supply you with a road map to navigate the ever changing course of this music industry -with as little back-seat driving as possible. Whether you are creating beats to propel an Emcee into the final round, working on an Anthem or just creating good music for your own pleasure, we’re counting on being able to provide you with the resources needed to bring your vision into focus. Thank you again. It’s your continued support that makes this magazine possible. See you in the lab. Producer's Edge is now blog driven! New content will arrive there first. Due to this change, all subscriptions will be processed and delivered as back orders. 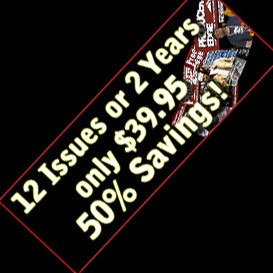 Ordering a 1 year, 6 issue package or two year, 12 issue package grants you the equivalent downloads from existing issues. For example, if you order 12 issues ( 2 year's worth of releases) you will be sent the downloadable XC subscriber's files for all 10 issues and 4X the value in packages from studio AVX.com. And so, your ENTIRE subscription will be filled at once. You will NOT be waiting on new issues to be released. $24.95 Thank you for subscribing to Producer's Edge digital magazine for 1 year or six issues. You will receive a BONUS Package from StudioAVX.com. This is NOT part of your subscription. It is the Ultimate Producer Package valued at $39.95. Your subscription begins with the current issue. Ultimate Producer package: Stop asking 'what's a good place to get some drums from' and buy these. This package should be used as the foundation of your drum library. It is the perfect first purchase. If you've been collecting drums for over ten years and own every drum machine and software drum library, don't buy this. If you want to start making beats with reliable drum sounds, buy this. $39.95 Thank you for subscribing to Producer's Edge digital magazine for 2 years or twelve issues. You will receive 2 BONUS Packages from StudioAVX.com. This is NOT part of your subscription. It is the Ultimate Producer Package valued at $39.95 and MOPHO $3.99. Your subscription begins with the current issue. You ARE NOT subscribing to a printed magazine. If I am not a subscriber to PE can I still get the FREE Digital Edition...for free? When we say FREE, we mean FREE. Go to Producer's Edge Magazine and click on the flipping pages and start reading, downloading and watching videos. It's that simple. What was the point of subscribing to PE if I can read the magazine for free in Digital now on the website? You would be joining the ranks of the XC or eXtra Content Subscribers who pay 24.95 a year to receive 6 Downloads that are associated with the current issue. It's a zip file(s) filled with more sounds, samples, software, extended articles and other PE Mag goodness. We process your subscription as soon as you place your order. Within 48 hours you will receive your eXtra Content Subscribers link to your downloads. Your password is activated for up to 3 different IP addresses. After those 3 slots are used, your password will be deactivated. Prices and items are subject to change. However if there is a price increase, you will be notified and given the opportunity to change or cancel your order before it is processed. Producer's Edge reserves the right to limit purchase quantities and to discontinue items and is not responsible for, and will not honor, printing or typographical errors. We accept Visa, MasterCard, PayPal and checks by mail. You will find all of these options on the checkout page of our web site as you place your order. We cannot refund money for magazine orders if the customer wishes to cancel. Since we remit money to fulfillment houses we cannot get it back after the order is placed, we are unable to refund the subscription. Producer's Edge will NEVER provide your personal information to any party other than the publisher and credit card companies without your prior permission. Copyright © 2006, Producers Edge Magazine. All rights reserved.